Our Search Landing Page tool makes it easy for you to create new pages which contain pre-determined search results. This allows you to highlight different cities, sub-divisions, zip codes and map areas in your market. Once your Search Landing Page is completed you'll never have to touch it again. The listings are always automatically refreshed. Google SEO loves our Search Landing pages. By specifying keywords that are unique to the page, Google will index you under these keywords thereby increasing your exposure. 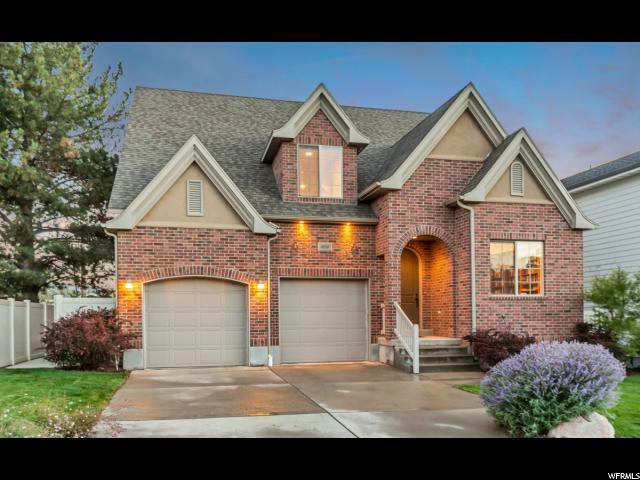 The following list of Salt Lake Luxury homes are currently available on the market. If you'd like to see any of these wonderful homes in person please give us a call today at 801-824-5070 and we will schedule a showing. 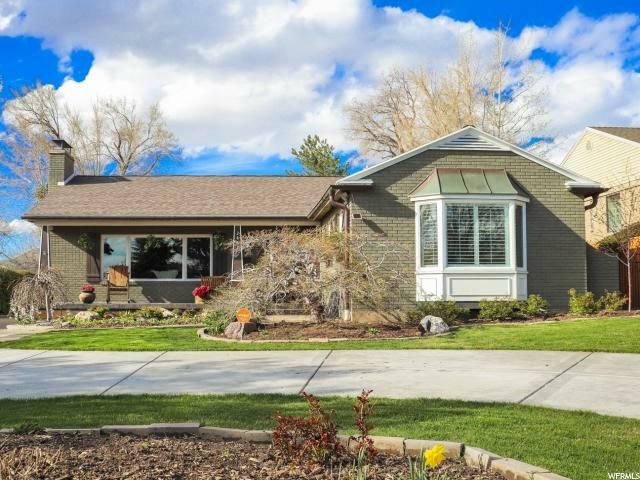 "Salt Lake Country Club: Fantastic (7 huge bedrooms) home; open, beautiful AND livable! Best schools, shopping, parks, downtown and freeway access. Move-in ready! Flexible move-in date through June. Two new furnaces/air conditioners (95% efficient), new mountain-view deck, natural gas patio grill, two water heaters, laundry up & down. Perfect for entertaining in a huge banquet-size dining room, three family rooms, multi-purpose/craft/exercise room & over-sized 2-car garage. Square footage figures are provided as a courtesy estimate only. Buyer is advised to obtain an independent measurement." 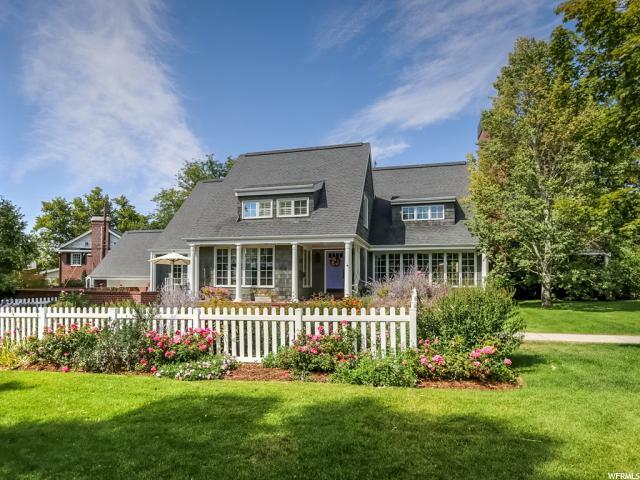 "This remarkable, custom built home is situated on a .61 acre lot at the mouth of the canyon and has unobstructed views of the entire Salt Lake Valley. Located on quiet, dead-end street in a secluded, East Bench neighborhood, this home is designed for comfortable living and entertaining with panoramic views from every room. The home's interior is naturally light from its vaulted ceilings with exposed beams and Pella windows that are complimented by warm wood accents. The formal living and dining rooms offer plenty of gathering space and flow effortlessly to the wraparound deck. The gourmet kitchen has beautiful wood cabinetry, granite countertops, hardwood flooring and a large center island. Loaded with upgraded features such as a Subzero fridge, Viking gas range with double ovens and convenient dumb waiter, this space also includes semi-formal dining and a large outdoor deck. The master suite continues in style with vaulted ceilings, a private deck and a luxurious master bath with a large corner soaking tub, his-and-her vanities and a walk-in shower. This well-designed home also includes an executive office, comfortable family room and a walkout lower level with an expansive recreation room. Outside, the brick and stucco exterior features a three-car garage with a level driveway and a large lot that is filled with mature trees, terraced garden beds and flat lawn areas. This spectacular home is just minutes from the University, downtown and neighborhood shopping and enjoys easy freeway access to the airport or area ski resorts." "This beautifully designed Mountain Style residence is located on an elevated 1.25 acre lot capturing panoramic views of the entire Salt Lake Valley and backs to National Forest land. The main level living spaces are open and spacious with vaulted ceilings and large windows to take in the picturesque views. The gourmet kitchen includes custom cabinetry, stainless steel appliances and a large center island with seating and an additional prep sink. Direct access to the back deck from the dining room, kitchen and master bedroom extend the living spaces to the outdoors. The main level master suite also enjoys vaulted ceilings, a beautiful gas fireplace, ensuite bath with dual vanities, a walk-in shower and a stand-alone soaking tub. The lower level has great gathering spaces perfect for entertaining and large enough for pool, ping pong or other table games. This large entertaining space has a majestic stone fireplace, wet bar, bonus room and office alcove. Owners will appreciate the radiant heat driveway and the back deck to enjoy the morning sunrise and mountain views. Low maintenance, professionally landscaped grounds designed with outdoor lighting. This idyllic residence offers great access to the Bonneville Shore Line trail, area ski resorts, freeways and the University. " "There are a few hidden gems in Salt Lake, and Gilmer Park is one of them. This home exudes charm, sits high on the lot with great views all around. There are features here that are unusual for a mature neighborhood, and too many to list. A visit will answer all the questions with a loud voice. It really speaks to you, and there are not that many occasions to buy and live in this wonderful community. The lot is private, the master has a balcony that overlooks the entire yard, and the home and yard are made for entertaining. This is your opportunity! Buyer to verify all info including square footage." "The home you have been looking for in the Harvard Yale Yalecrest area. Meticulously renovated by a very fastidious designer. Home has features that are over the top quality in style and detail. 3 large bedrooms on the 2nd floor, 2 bathrooms on 2nd floor including a 2nd laundry. Hardwood floors in the addition were milled to match the original, leaded glass period windows and door hardware. 3 fireplaces. Luxury owners suite like no other with separate shower tiled in Carrera Marble, and whirlpool tub, large walk-in closet. The kitchen has custom cabinetry a farm sink, beveled edge Carrera Marble counter top and Sub-Zero/Wolf appliances. 3 bathrooms have heated floors, there is external heat tape on roof, and the list goes on. Unfinished storage above 2 car garage is extra large space ready for multiple uses.One must see this jewel to appreciate it. " 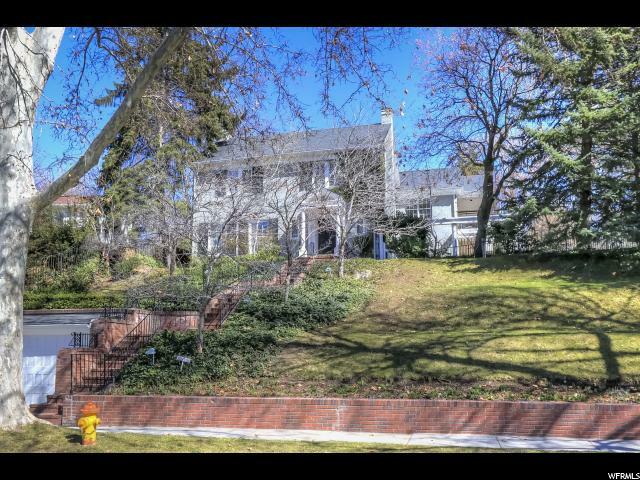 "An amazing one-of-a-kind lot (.37 acres) on one of the most desirable and beautiful streets in all of Salt Lake City. This gem backs up to Red Butte Creek & Miller Park Bird Refuge/Bonneville Glen a 8.75 acre hidden oasis. The home was originally built as a model of luxury in 1929 with imported crystal chandeliers, mahogany hardwood floors, Italian marble, and mahogany trim throughout. This is a perfect opportunity to renovate and update the home or to build your dream home on this unique piece of property, which is actually two lots combined! Do not disturb the homeowner. Please walk around the lot with the listing agent by appointment only." "Stunning architecture, brilliant design. Raising the level of a luxury home. It is a gracious and warm home filled with an abundant amount of light. Discerning buyers will appreciate the timeless design, attention to detail & craftsmanship that make this extraordinary home a true work of art akin to the best of the best properties. This is a once in a lifetime opportunity to own a slice of heaven! The oversized master suite is elegant and grandiose. With upper level living, designer walk-in closet, stackable washer and dryer. Total Privacy. Three additional guest suites offer privacy and convenience. Stylish entertainment areas include a wet bar with burl wood cabinets. The home includes a gourmet kitchen with custom cabinetry, Sub-Zero and Wolf appliances custom built. Natural grain walnut wood staircases and main living floors." "Remodeled St. Mary's rambler located on the beautiful Bonneville Golf Course, complete with amazing mountain views. Step inside to new hardwood floors throughout the main, living and dining rooms. High-end lighting. Professional chef's kitchen with Subzero refrigerator, marble countertops, gourmet 6 burner range, and double ovens. Kitchen overlooks the family room and an amazing sunroom with views of the golf green. Spacious main floor master suite with spacious his and her walk in closets. Main floor laundry/ mudroom. Open space in the downstairs family room, complete with an additional kitchen and 3 bedrooms. Lighted pergola with a cozy patio and gas fire pit. Spacious grass areas to play as well. The home has a brand new roof, new HVAC, plumbing, electrical with cat-5, instant hot water heater, copper rain gutters and spacious 2 car garage. All the privacy you need while being within walking distance to local restaurants and coffee shops, as well as hiking and biking trails." "Owner/Agent. Amazing teardown/New build by KB Builders. Don't miss your chance at a brand new home in this highly coveted area!! Sub Zero/Wolf appliances, quartz countertops, white oak hardwood floors, custom tile throughout, freestanding tub, custom closet, secret pantry, main floor living, custom linear fireplace, custom cabinets, the list goes on and on!! Sales price includes full landscaping with firepit and new cedar fencing. Vacant and easy to show. See agent remarks for showing instructions." 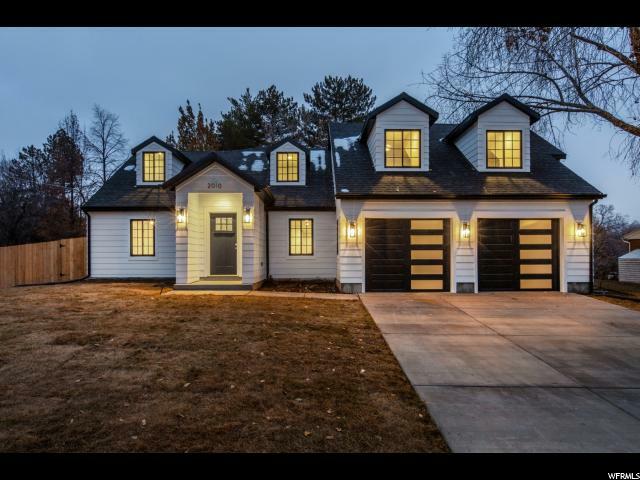 "Rarely do you find such quality construction in a truly newer home located in one of the most desirable and coveted communities in Salt Lake City - the walkable and popular Wasatch Hollow area. 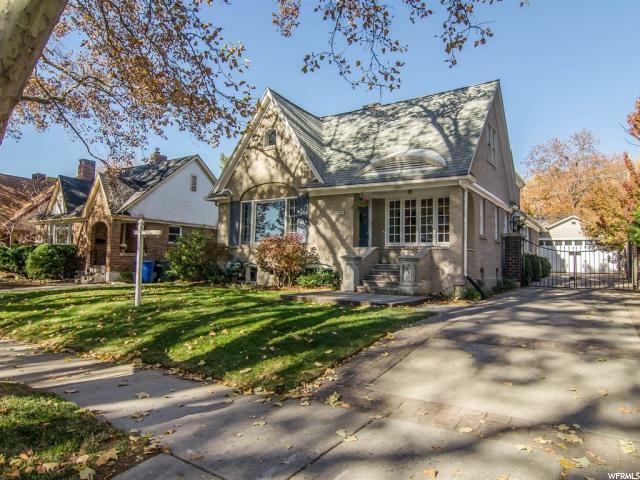 This beautiful and spacious two-story, one-owner home was custom-built in 2006 (not a mere remodel or reconstruction of an older home) and is conveniently nestled near schools, parks, restaurants, shopping centers (Emigration Market and the shops at 15th and 15th), the University of Utah, and downtown Salt Lake City. The spectacular entrance welcomes you with a high soaring ceiling, an elegant chandelier and a custom-curved staircase with wood railing, iron balusters and new carpet. The bright and open gourmet kitchen with gorgeous staggered custom cabinets, detailed woodwork, travertine tile, exquisite granite countertops, recessed lighting, stainless steel appliances, and large island is ideal for all types of gatherings and entertaining. The magnificent dining area, also with travertine tile, vaulted ceilings and recessed lighting receives abundant natural light from large windows with southern exposure. The expansive family room is bathed in southern sunlight and offers a gas fireplace accented with an amazing custom-crafted wood mantle, vaulted ceilings, recessed lighting and new carpet. The master bedroom on the first floor also receives southern light and has an attractive master bathroom with separate tub and shower, extra wide vanity with double under-mount sinks, granite countertops, floor to ceiling linen cabinet, and a spacious walk-in closet. First floor living is also enhanced with a must-see private study that boasts vaulted ceilings, a great window, and built-in book shelves and cabinets with access to an adjoining 1/2 bath. The laundry room with built-in cabinets is also conveniently located on the first floor. Upstairs are 2 large bedrooms and an extended full bathroom along with 2 bonus storage rooms. 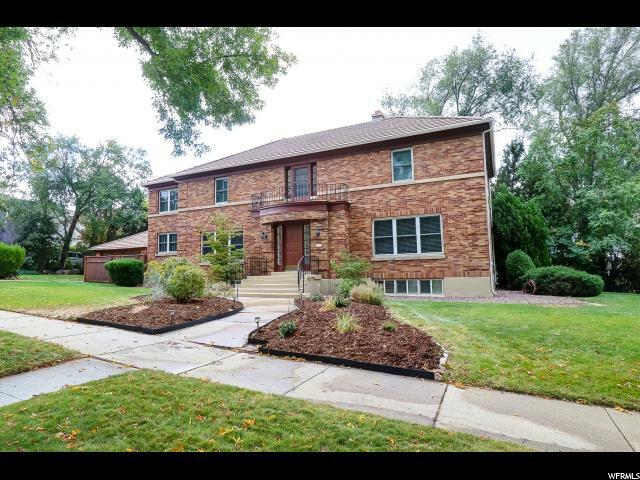 The masterfully designed finished basement includes a wi"
"Welcome home to 912 South 1000 East, located in the heart of the vibrant 9th & 9th neighborhood. 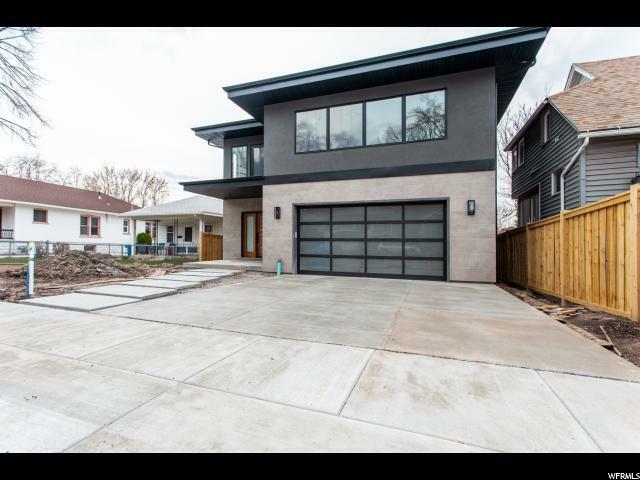 The presence of this modern-contemporary, new construction home is classy and elegant from the moment you walk through the front door. Finish details such as the 5 inch wide, white oak hardwood floors, Blanco Carrera marble in many of the bathrooms, Viking appliances in the kitchen and white subway tile give a classic touch to the modern architectural style of the design. An attached two-car that segues into a proper mudroom with built out lockers and bench seating which is a coveted commodity in a historic district like 9th & 9th. The yard is a decent size, but manageable for a modern lifestyle. The upstairs balcony which is accessible from the master suite and the over-sized hallway on the second floor overlooks old-growth trees and peeks at the Wasatch Mountain range. 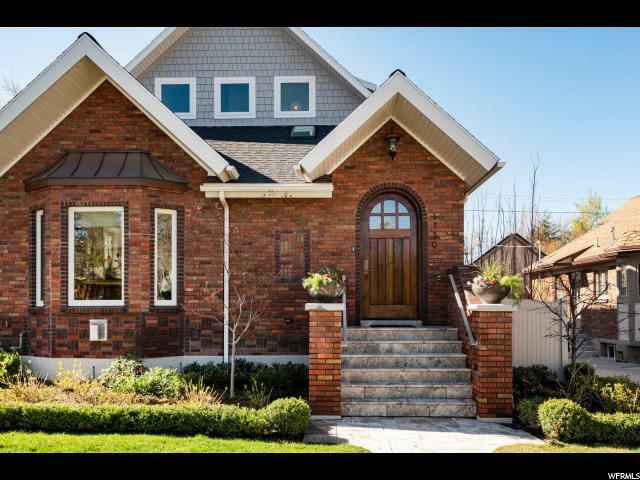 Regarding location, the 9th & 9th area is an iconic neighborhood situated a perfect distance between downtown Salt Lake and the Sugarhouse district. Within walking distance of the Coffee Garden, the Tower Theater, Mazza, Pizza Nono, Publik Coffee, Liberty Park, Vessel Kitchen, Warby Parker, Liberty Taphouse, and Pago. There is no lack of dining and shopping options you can walk to from this home. Finally, a home that reflects your style! Square footage figures are provided as a courtesy estimate only . Buyer is advised to obtain an independent measurement." "No expense was spared by these sellers in completely rebuilding this 1930's Yalecrest Classic into their forever home, and then... they found another forever home. You can now be the beneficiary of this seller's thoughtful design choices and desire to build a home that was done right with no corners cut. From the things you don't see such as new plumbing, electrical, and smart home systems, to the touches that you do see- the beautiful barn doors, the solid cherry cabinetry, 1 true hardwood floors & added upper level with large master suite, office & bedroom/nursery & the fully landscaped yard- you can be sure that you'll be getting the best of the best in a home that is timeless, built to last and located in a highly sought after Salt Lake neighborhood. Seller has conflicting measurements for the square footage. If square footage is of importance then Buyer is advised to verify to their own satisfaction "
"Newer Construction in Harvard-Yale! Built from the foundation up in 2005...You Don't Want to Miss this Gorgeous Home! *Grand Entry*Designer Finishes Throughout including Solid Walnut Doors, Travertine, Hardwood, Granite and Plantation Shutters*Chef's Kitchen with 6-Burner Viking Range, Built-In Refrigerator, Gorgeous Walnut Cabinets*Eat-In Kitchen and Formal Dining*Unbelievable HUGE Master Retreat with Adjacent Room for Office or Gym*Master Bath with Walk-In Closet (You Won't Find a More Unbelievable Master Suite in all of Harvard-Yale!! )*Large Bedrooms on Main and Upper Floors*3 Main Floor Bedrooms (Currently used as Additional Den/3rd Bedroom is Also a Craft Room)*Brand New Basement Build 2018-Gorgeous!--Room for Pool/Ping Pong/Games*Second Family Room*Huge Storage Room*Attached Double Garage*Attached Entertaining Patio*Low-Maintenance Fenced Yard with Access to Huge School Fields Across Street--Perfect for Kids-and Zero Maintenance for Homeowner! *Owner Moving Out-of-State and Willing to Sell Select Furnishings (Ask Agent for details)*Seller Also Open to a short Lease-Back Period*Minutes to World Class Ski Resorts, Schools, Parks and Amenities*All information deemed accurate and reliable; Buyer to verify all. *"
"This stately two-story in the heart of the historical Harvard/Yale area demands your attention. From the minute you walk through the front door you experience its greatness. A grand living room to your left and a beautiful staircase to your right. This homes offers exceptionally large rooms for its era, including a large formal living room, formal dining, wood paneled library w/firepl and real master suite. Don't miss out on your chance to live in this charming neighborhood. Fireplace in basement is nonfunctional." "RAW LAND, BRICKS AND MORTAR, AND LOCATION. 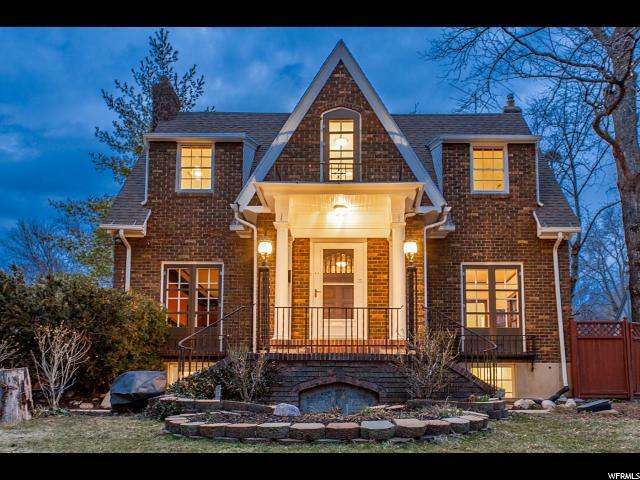 This brick rambler is ideally located in the heart of the coveted Yalecrest neighborhood and is walking distance form Eggs in the City, the Harmons neighborhood grocery store, Jolley's pharmacy and the new One O Eight restaurant. This home was built on a double lot and is being sold with the adjacent vacant lot offering buyers the rare opportunity to enjoy this charming rambler, or design and build their dream home on the combined 0.41 acre property. This home was loved and cared for by its original owners who recently renovated the walkout basement mother-in-law apartment. This space has a fully renovated kitchen that flows into an open-concept dining and family room with a gas fireplace surrounded by custom built-ins. Two large bedrooms and two completely updated bathrooms make this space comfortable and inviting for residents and guests alike. The main level of the home is flooded with natural light and full of vintage charm with original crystal light fixtures, abundant built-in storage and timeless wallpaper. A generous living room with a gas fireplace, formal dining room with access to the covered back patio and kitchen with breakfast nook serve as great gathering spaces. With mature landscape, premiere location and plenty of space, this property offers unlimited potential. " 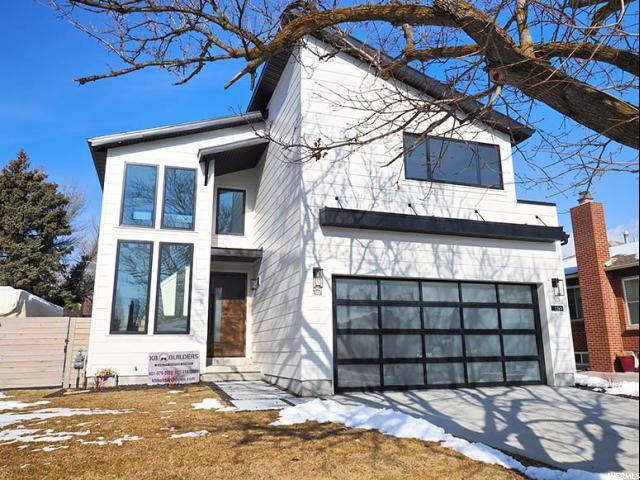 "This lovable Logan Avenue two-story is a rare blend of newer construction in a quaint, walkable Sugar House neighborhood. Built in 2005, it features an inviting front porch, open floor plan with 9 foot ceilings throughout, gourmet kitchen with custom cabinets, large island, mud room and walk-in pantry, main floor master suite with walk-in closet, double vanity, soaker tub, and large shower. Upstairs includes three large bedrooms with ensuite bathrooms, a private covered deck with incredible city views, and a laundry room. The basement is perfect for entertaining with a theatre room, family room, wet bar, guest bedroom, and bathroom. Not be missed out back is a beautiful pergola, pavered patio with fire pit, and a rare 3-car garage with tall doors and tons of storage. 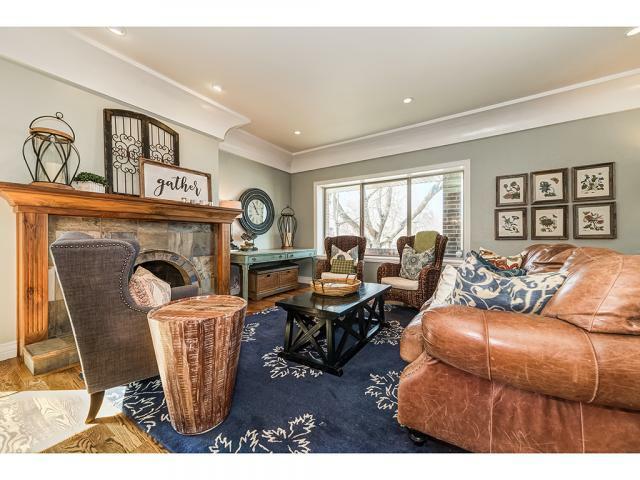 Like the home, this location is ideal within walking distance to Westminster, 15th & 15th, Wasatch Hollows and just minutes to University of Utah, Downtown Salt Lake City, and access to mountains via I-80. " 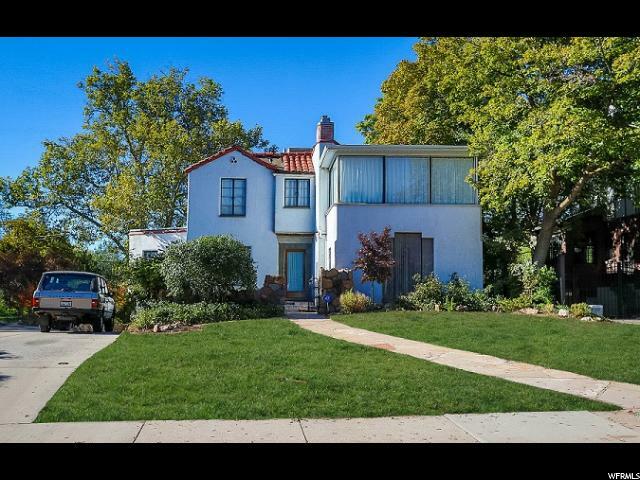 "This classic 2-Story is nestled on almost a half acre in the prestigious St Mary's area. Grand entry with original wood staircase is very inviting and welcomes you to the other formal spaces in the home. Large living room with hardwoods, crown molding and fireplace is ideal for entertaining. Main floor office/den with fireplace and formal dining room off kitchen. Kitchen has been updated with Corian counters, wet bar and breakfast island, two ovens and two dishwasers. Tall ceilings and an abundance of natural light are evident in every room throughout the house. Four bedrooms upstairs with master bed/bath and upstairs laundry. Two bedrooms downstairs each with separate baths, large family room with fireplace. This is a wonderful property that has been meticulously maintained. All new plumbing with a 10 year warranty. Cat 6 wired throughout. Conveniently located, close to downtown and the university area. " "NOTICE FOOTAGE--ALL ABOVE GRADE! (no basement) thus, this home seems HUGE for 3000 feet. Home backs up to Emigration Creek and has views with walk-ability. This is a complete rebuild with a large addition and brand new attached/oversized 2 car garage; NOT your typical remodel. The way the home was designed creates a very private flat yard with an incredible view of the creek. Huge RV parking to the south which as you know, does not exist in this area. Exposed steel in kitchen to open the entire kitchen/great-room and formal dining area. Site views from front to back on main with 3 huge slider glass doors to open to outdoors. Master on main with large walkin closet and huge bath with his/her. Up has 3 large beds with large closets and a full bath AND a large hangout loft/computer study area with classic dormer window nooks. It's classic and fits the neighborhood but gives you all the modern conveniences of NEW." "Unusually spacious home in tree-lined, pedestrian-oriented Harvard/Yale neighborhood. 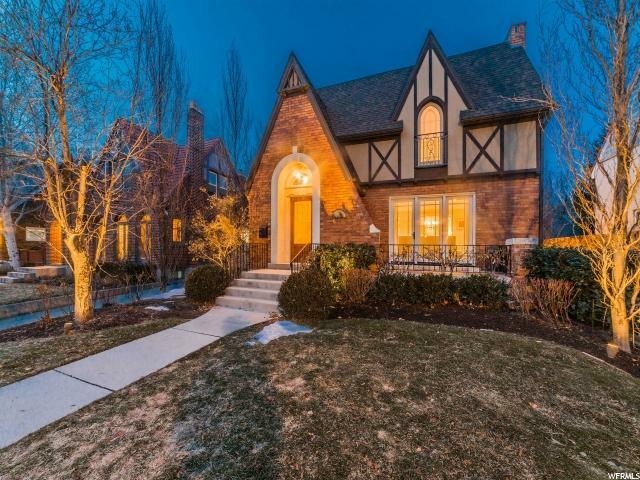 Beautifully restored, remodeled and expanded Tudor. High coved ceilings in living and dining rooms, hardwood floors, mahogany fireplace. Second floor master suite with vaulted ceiling, master bath and walk-in closet. Kitchen has granite counters, stone floor, stainless appliances, double wall oven. 5 bedrooms plus sewing/craft room and exercise room. 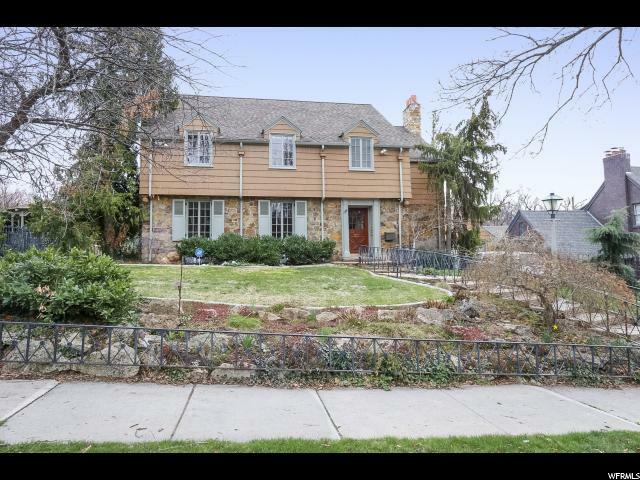 5 baths, two large family rooms, 3 fireplaces, large main floor laundry. Tons of storage spaces. 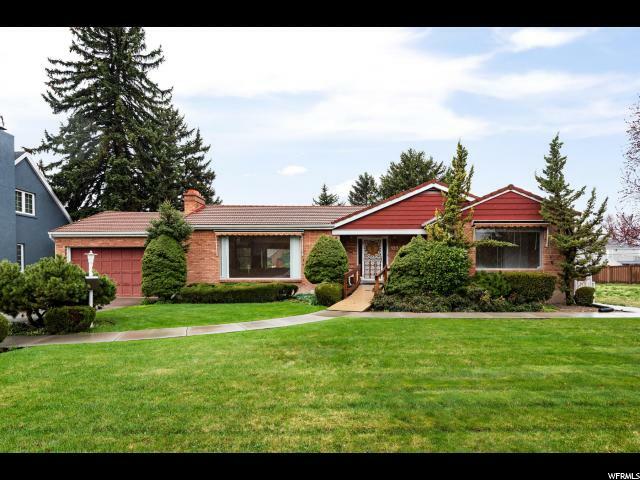 Incredible location in walking distance to Bonneville Elementary, U of U Shuttle, Research Park, and Harmons Emigration Market. 2-Car garage, gated driveway. Deep lot, patio and large lawn in back. 5000 sq. feet. Square footage figures are provided as a courtesy estimate only and were obtained from an appraisal. Buyer is advised to obtain an independent measurement." "This is an amazing home in the beautiful Gilmer Park neighborhood. The home has recently been upgraded, with new paint, fixtures, and carpet. You will love this home. This is exactly the type of home when people think of Gilmer Park. Short walk to 9th and 9th. "